The Women War Workers Memorial was erected by members of the 9th Brigade A.I.F. in appreciation of women war workers during World War One. 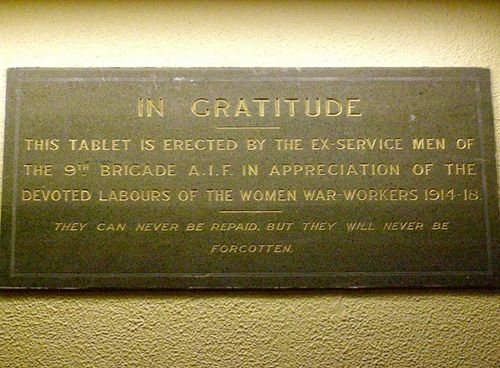 The 9th Brigade, A.I.F., tablet, to commemorate women who were founders for the brigade, has been completed. It will be given to the City Council shortly at a special ceremony. It is suggested that the council might keep the tablet until Newcastle has a war memorial. The first general reunion of the 9th Brigade since the war was held in Newcastle last year, and it was decided then to subscribe to the cost of a tablet in appreciation of the women war workers. Newcastle Morning Herald & Miners' Advocate, 28th April 1937. Devoted Labours Of The Women War-Workers 1914-18.